He has a very cool motion chart at his blog (that I can't find the embed code for) that maps out the null effect, so click through to watch it. 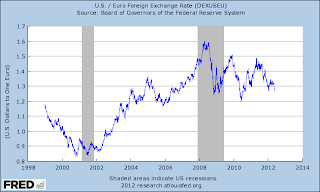 When Did the Dollar Become the World's Reserve Currency? This paper offers new evidence on the emergence of the dollar as the leading international currency, focusing on its role as currency of denomination in global bond markets. We show that the dollar overtook sterling much earlier than commonly supposed, as early as in 1929. Financial market development appears to have been the main factor helping the dollar to surmount sterling’s head start. The finding that a shift from a unipolar to a multipolar international monetary and financial system has happened before suggests that it can happen again. That the shift occurred earlier than commonly believed suggests that the advantages of incumbency are not all they are cracked up to be. And that financial deepening was a key determinant of the dollar’s emergence points to the challenges facing currencies aspiring to international status. I haven't read it yet, but I'm predisposed to disagree with the conclusion. 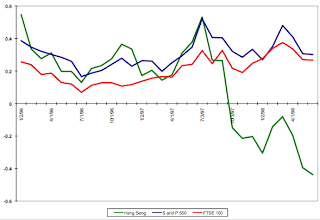 Some argue that we understate the significance of the Asian crisis. 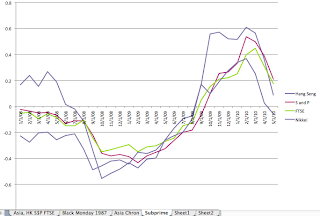 So, here are three graphs of equity market correlations in moments of rather severe crisis. The unit in each is 12 month percent change. 1. Black Monday, October 1987. Biggest Single Day Correction in US History. 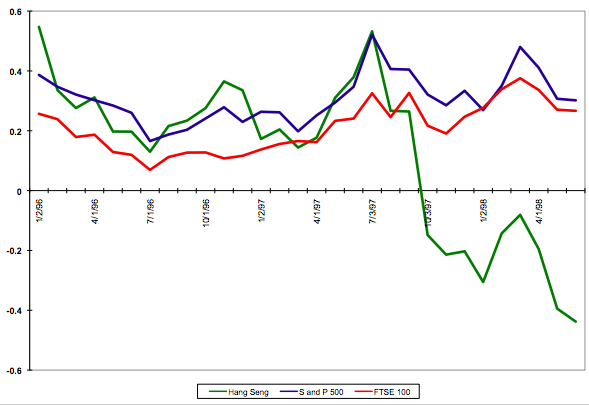 Notice that the FTSE and Hang Seng follow the US down. Notice the correlation 10 years prior to the 1997 Asian crisis. 3. US Subprime, 2007-09. The rest of the world follows the US down. So, is Greece more like Thailand, or is Greece more like the United States? We think Greece is more like Thailand. Posted by Kindred Winecoff at 12:24 AM . Further economic and financial deterioration in Greece would certainly have negative impacts there and might adversely affect Greece's southern European neighbors, who are facing similar circumstances. But financial weakness in Greece is unlikely to spark a global crisis analogous to the one triggered by Lehman Brothers' collapse in September 2008 -- even if economic woes eventually force Greece to exit the monetary union. Instead, the global consequences of southern Europe's debt crisis are more likely to resemble the Latin American sovereign debt crises of the early 1980s, the East Asian crises of 1997-1998, and Argentina's crisis at the turn of the millennium. Each of these had significant local effects -- widespread bank failures, sharp increases in unemployment, large exchange-rate devaluations, deep recessions -- that were not transmitted globally. Indeed, in each of these cases the global economy continued to grow, major world equity markets held their value, and world trade expanded. None had the dramatic global consequences sparked by Lehman's collapse. I think you understated the global impact of the 1997 East Asian crisis. I'd rather avoid another one of those. On the one hand, I agree: I'd rather avoid another one of those, although I don't know how that's possible. On the other, I don't think we understate the global impact of the E. Asia crisis. I think many people dramatically overstate it. The period during which the E. Asian crisis occurred -- the late 1990s -- is associated with one of the largest periods of global economic growth ever. These days we look back on it with nostalgia, and wonder how we can do it again. The E. Asian crisis was a crisis for E. Asia, but not so much for everyone else. 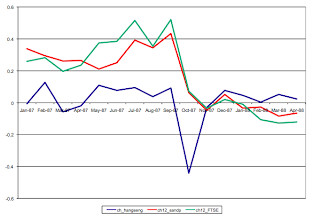 I think it's likely that the S. European crisis will be the same. Actually, given the slow-motion nature of the thing, I think it's likely that the S. European crisis will be even less of an event. We may soon see. I hope we don't. If there weren’t any possible resolution, there wouldn’t be any incentive to engage in crisis bargaining. What we’re seeing suggests that the players on both sides think that there is a real chance of catastrophe, but also a real chance of a deal. Whether or not there is a possible resolution is most likely private information. (Or, more accurately, neither side knows the truth.) Let's look at this from Germany's perspective. Who are they negotiating with? For all intents and purposes Greece does not have a government that is capable of negotiating. Any future Greek government also has an inability to make a credible commitment to uphold any negotiated settlement in the future, which is why Germany had previously asked for all political parties in Greece -- whether in the government or not -- to approve of the previous bailout program. It is not clear right now who "Greece" is, much less what it is willing to accept. Nor is it necessarily clear (to me) that Germany believes that there is a real chance of catastrophe for them if Greece exits. Perhaps there is, but it's probably not an economic catastrophe. 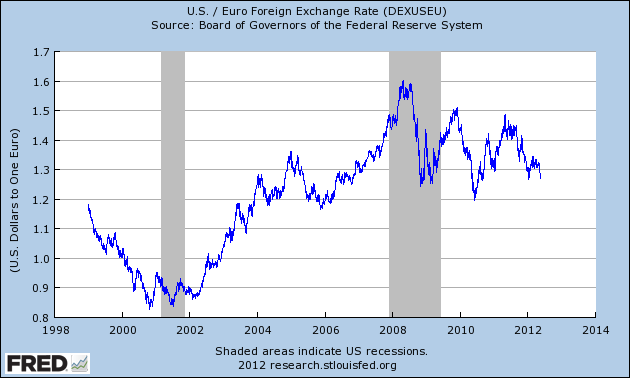 At this point it might be cheaper to shore up the banks than to keep funding Greece indefinitely. Remember that Greece's creditors have already taken very large haircuts. Remember that European banks have had years to prepare for this, and European regulators have (presumably) been forcing them to do so. Euro governments, the ECB, and the EFSF would lose something on the order of €200bn from a full Greek default, of which €75bn would come from Germany. This is not nothing -- about 3% of Germany's GDP -- but it isn't enough to sink Germany either. More likely Germany is worried about the political ramifications of a break-up of the eurozone, but in that case they should be interested in ensuring that they are not blamed when that happens. This implies that they will engage in negotiations right up until the end, and perhaps even after it, to demonstrate that they made a good faith effort to keep the monetary union intact even if they believe that there is no possible resolution that actually keeps the monetary union intact. At a guess, Greece has considerably more bargaining leverage than it might seem to at first. One useful index of bargaining strength is relative levels of sensitivity to breakdown/catastrophe/failure to reach a deal. It’s plausible that Greece is relatively indifferent to breakdown at this point – years of grinding austerity inside EMU seem barely preferable to the costs of exiting the euro. In contrast, Germany could see the collapse of the euro (and consequent very serious economic costs) if a Greek exit leads to the collapse of confidence in Spanish, Irish, and worst of all, Italian banks. If I were to lay a bet on which side is likely to fold first, I’d be putting my money on the Germans. Again, it's not clear who "Greece" is or what their bargaining position is. As Daniel Davies says in comments on Farrell's post, there is no reason to think that Greece is indifferent between staying in or getting out. Something like 80% of Greeks say that they want to stay in. Even Tsipras has stated no intention to exit. The best case scenario of leaving -- probably Argentina -- is not very good, and I wouldn't be optimistic about the best case scenario obtaining in this case. 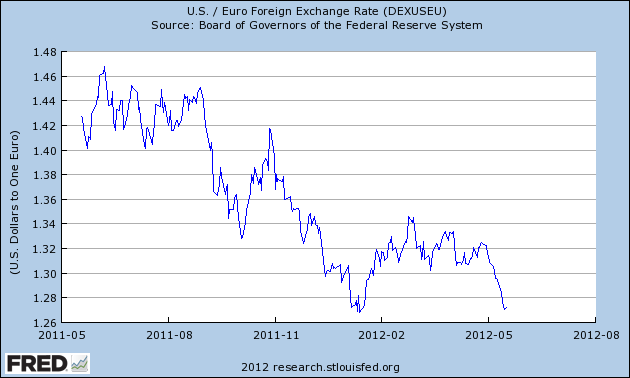 So how much leverage does that really give Greek leadership? If their citizens want to stay in, and the costs of leaving are extreme, then Germany can demand quite a lot. Nor is it clear that a Greek exit would lead to a collapse in Spain, much less Italy, or that such a thing could be avoided even if Greece stays in. The fundamentals are crap either way. It's not clear that a collapse in these countries would be devastating for Germany. They've maintained economic growth thus far, and capital flight from the GIPSIs would likely move into Germany, giving them further fiscal flexibility to deal with their banks and macroeconomy. Right now the political dynamic in Europe is about who gets the blame for a Greek exit. If blame cannot be assigned in a politically satisfying way then they will continue to muddle through. However the greater the costs associated with keeping Greece in, the more likely the blame will shift away from Germany and the more likely that Germany will refuse to pay on any terms that are acceptable to Greek leaders. Right now there are two, and only two, options on the table: help Greece with an orderly exit from the Euro (and crystallise the losses in Berlin, Washington, etc), or print money at the ECB to send a monthly paycheck to all those Greek unemployed. This latter suggestion may seem ridiculous (then go for the former), but so is talk of printing to fuel inflation in Germany (go tell that old wives tale to the marines). If Greece isn’t allowed to devalue, then some device must be found to subsidise Greek labour costs and encourage inbound investment – and remember, given the reputational damage inflicted on the country this is going to be hard, very hard, work. The second of those is not palatable. It would wreck what remains of the political integrity of the Euro project, which has already been corrupted by the less-than-democratic approach to the bailout. Political integrity is not about keeping Greece in on whatever terms... moral hazard is a real risk and the original institutions designed to combat moral hazard (eg Stability and Growth Pact) have been obliterated as has the independence of the ECB. In other words, it's not clear what political integrity Germany would really be fighting for. The entire EU social contract has to be re-written anyway, at least implicitly. Given that, Germany may wish to re-write it on more stable terms. There is a very real chance that over a medium term time horizon Germany would be better off with Greece out of the eurozone. If that's the case then this isn't a brinksmanship game. I hope you can spot the egregious error at the end. The House of Representatives has already voted to abolish it. Via all the poli sci grad students in my Facebook feed. Indeed, the alternative to good social science is not no social science but bad social science. How much authority should we give to such work in our policy decisions? The question is important because media reports often seem to assume that any result presented as “scientific” has a claim to our serious attention. But this is hardly a reasonable view. There is considerable distance between, say, the confidence we should place in astronomers’ calculations of eclipses and a small marketing study suggesting that consumers prefer laundry soap in blue boxes. He then goes on to make a nearly uncountable number of false assertions, misplaced blames, understatements of the usefulness of the social sciences, and overstatements of the development of the natural sciences. It's hard to know where to begin. Take the above quote for starters: The first sentence asks about policy decisions. The concluding sentences reference two potential avenues for inquiry that, so far as I can tell, have nothing whatsoever to do with policy. But often, as I have pointed out for the case of biomedical research, popular reports often do not make clear the limited value of a journalistically exciting result. Good headlines can make for bad reporting. Biomedical research may have implications for policy -- e.g. what treatments should be covered in insurance plans or something -- but it is not a social science. Additionally, if journalists misread research findings that is an indictment of journalists, not researchers. Second, and even more important, there is our overall assessment of work in a given science in comparison with other sciences. The core natural sciences (e.g., physics, chemistry, biology) are so well established that we readily accept their best-supported conclusions as definitive. (No one, for example, was concerned about the validity of the fundamental physics on which our space program was based.) Even the best-developed social sciences like economics have nothing like this status. Are the core sciences so settled? I'm no expert in any of them, but my impression is that they are filled with hotly-contested debates concerning almost all of their "definitive" conclusions. Do we exist in a multiverse? Does evolution operate at the level of the genotype or phenotype? Can a universe (or multiverse) arise from nothing, and if so what is the definition of "nothing"? Is consciousness a biological function, and if so how did it arise and to what species does it extend? Should we accept the validity of bodies of work based only on their perceived "status"? As determined by who, exactly? 40% of Americans don't believe that evolution occurred. Despite clear evidence, only 60% of Americans believe that climate change is happening at all, and a majority believe that humans do not play a major role in altering the climate. Granted, those polls are examples of social science so Gutting would likely give them no credence but even then the question remains: where does this status come from, and why should it matter? Perhaps more pointedly, everyone should well be concerned about the "validity of the fundamental physics on which our space program was based" considering the impressive number of boondoggles and outright tragedies that resulted from it. There are many questions of policy relevance that social scientists have not yet answered sufficiently well to base policy on them. There are also many questions with policy relevance that are more or less "settled" by social scientists, in that they have coherent theoretical explanations that are supported by multiple empirical studies. There's no point in running down a list, which could only be illustrative in any case, but one example might be that if you pay people to put silly arguments into print under their own name then they will be more likely to do it than if they were taxed for it. Is there any work on the effectiveness of teaching that is solidly enough established to support major policy decisions? The case for a negative answer lies in the predictive power of the core natural sciences compared with even the most highly developed social sciences. Social sciences may be surrounded by the “paraphernalia” of the natural sciences, such as technical terminology, mathematical equations, empirical data and even carefully designed experiments. But when it comes to generating reliable scientific knowledge, there is nothing more important than frequent and detailed predictions of future events. We may have a theory that explains all the known data, but that may be just the result of our having fitted the theory to that data. The strongest support for a theory comes from its ability to correctly predict data that it was not designed to explain. This is both true and one of the weaknesses of the social sciences. But refer to the quote from PM with which I began this post, and consider the relative youth of social scientific inquiry that has employed the "paraphernalia" of the natural sciences. In some cases we've only been doing it for a decade or several, mostly with pretty poor data and not much sophistication. But these problems are being corrected with time and experience -- as science should do -- and even the flawed efforts of the past are better, in aggregate, than their alternative: setting policy according to how Thomas Friedman's (or Gary Gutting's) gut feels about it. Gutting then goes on to suggest that social science's problem is that it cannot do randomized controlled experiments on its subjects and therefore cannot make "detailed and precise predictions". Setting aside the fact that, in many cases, neither can astrophysicists or evolutionary biologists, this is a) changing in the social sciences; b) not a panacea in any science, social or otherwise; c) RCTs are about testing hypotheses (or, sometimes, just seeing what happens) not generating them; d) the analysis of observational data has always been considered a valid way to examine the rightness of theories in the sciences. Should Galileo not have been trusted because he couldn't perform a randomized controlled experiment on the earth's orbit around the sun? Had Darwin no insight on natural selection because he could not perform a trial to determine why the beaks of finches in different places varied in thickness? Without a strong track record of experiments leading to successful predictions, there is seldom a basis for taking social scientific results as definitive. True. True not because social science findings are so unreliable as to make them useless. True because all findings in all sciences are provisional. That is the hallmark of science. To criticize science for not being definitive is like criticizing philosophers for asking questions. Well then God help us all. More seriously, perhaps we should use research to influence policy decisions when the research is relevant and when there is strong empirical support from multiple research programs, while recognizing that changed circumstances or new information may cause us to modify these programs later. I'm not suggesting that ever will quite happen -- if they notice it all opportunistic leaders will cherrypick findings that support their preferences and disregard the rest -- but surely that's a better goal than relying on the "good sense and critical intelligence" our overlords do not possess to solve our problems. And when our leaders stray, or when they set policy cynically, it is the role of intellectuals to use every faculty at their disposal to point out the emperor's nakedness. That is easier done with the arsenal of social science at one's disposal than with intuition or impression alone. Gutting is a professor of philosophy at Notre Dame. It's worrying to see him so dismissive of his colleagues in the academy. Perhaps he should give them some more of his time. Macroeconomics is the study of policy failure. Once an issue goes away the field loses interest. Leave aside for now whether or not that is strictly true, or whether it was inadvertent. When I read the first of those sentences I immediately thought "then why not study why the policies fail, dammit!" After a bit of reflection I've realized that macroeconomists think that's what they're doing. They have models, to which they are wedded ideologically and/or reputationally, which are internally coherent but externally invalid. * When they try to explain why they are invalid they claim that policymakers aren't doing what the models tell them they should do. That's what Sumner means by "policy failure". And they explain why policymakers aren't doing what the models tell them they should do by either demonizing them, calling them ignorant, or claiming that they are members of cults believing in confidence fairies, bond vigilantes, the hive mind of the Borg, or some discredited or otherwise objectionable ideology. The assumption here is that policymakers are, or should be, utilitarian Philosopher Kings whose goal is to maximize output and employment while minimizing inflation. But maybe, just maybe, that assumption is false. If we get rid of it then we don't have to appeal to superstition or metaethics to explain the behavior of policymakers. Instead we can treat policymakers as being interested in gaining or retaining office, and that the best way to do that is not necessarily to bring unemployment down to its natural rate as quickly as possible. In other words, we can treat macroeconomic outcomes not as "policy success" or "policy failure", but as things that benefit some groups of people and harm others. From the viewpoint of a policymaker a policy success is one in which the policymaker retains office, and a policy failure is one in which she does not. To remain in office she must appease some number of people (what we often call a "minimum winning coalition") and that's all. In advanced democracies that coalition is largely comprised of relatively affluent people who own some type of equity whose value is more sensitive to inflation than whether the marginal unemployed worker gets her job back. So when policymakers set policy to win over that person it isn't a "failure"... it's the whole purpose. This is what Steve Waldman was driving at in his "choosing depressions" posts. This is the dynamic that I blog about in almost every post. This is what I was writing about in a prior post, "The Problem with Macroeconomics Is the Macroeconomists". If the world doesn't work the way that macroeconomists think it should, then maybe that's because macroeconomists don't understand how the world works. That doesn't mean that macroeconomists, or anyone else, can't have their own preferences. Krugman's blog and associated book is titled Conscience of a Liberal, not Explaining How the World Works. But that's quite a different thing from saying that "macroeconomics is the study of policy failure". To acknowledge that different groups have different preferences over outcomes is to acknowledge that the definition of "policy failure" is a not a constant but a variable, and macroeconomics has nothing to say about that. That's why we need political economists. *Of course they will all protest that their pet model is not externally invalid, only everyone else's is. 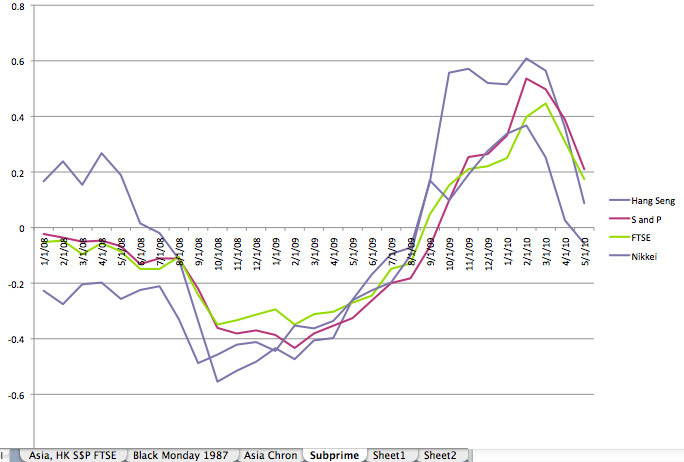 However no macro models have performed very well in this crisis. No macro models can explain the global nature of this crisis, why countries with similar characteristics have had vastly divergent outcomes, etc. The best argument that most macroeconomists can put forward in support of their preferred model isn't "it worked" but "it hasn't been sufficiently tried". But people still use the term, often to denote something to the effect of "not enough Keynesian/monetarist stimulus". It seems to me that that is a different thing from austerity, and implies a different political interaction. As Steve Waldman notes, we're choosing our depression, and we're doing it in a way that prolongs the recovery but does not choke it off. This is being done for political reasons, but the reasons are very different than those that currently obtain in Greece, e.g. Greece is practicing true austerity -- or at least something closer to it... they keep agreeing to austerity but then missing their targets -- under duress; the U.S. is simply choosing to accept the risk of a slow recovery over the risk of higher inflation. For the fact is that you can’t just look at spending levels to ask what is happening to spending programs. Here in the United States spending on unemployment insurance and food stamps has risen sharply, not because the welfare state has expanded, but because a lot more people are unemployed and poor. Similar effects are at work in European countries, which have stronger safety nets than we do. Right, but cutting social spending programs is pretty much the definition of austerity, at least as it used to be defined in relation to the implementation of the Washington Consensus during crisis periods. In fact, Krugman refers specifically to spending cuts elsewhere in the same post. So if we're doing the opposite of that how is it we're practicing austerity as well? Mark Blyth has been working on a book (due out next year) detailing the history of austerity as a policy idea, so perhaps he can give us a better definition. In the video above, he describes austerity as paying down public debt through the slashing of social services. But if we're not doing that in the US (and some other countries) -- if automatic stabilizers have kicked in -- then are we really practicing austerity? If so, only on the margins and not in aggregate. I think this is important because it implies different political logics. This is what Waldman was writing about. The political logic of "austerity as penalty for emergency finance", usually to prevent moral hazard and/or force through politically unpopular reforms, is quite different from "tolerate slower recovery because of concern about future inflation". To give one example: both the Tea Party and the Occupy Wall Street movements arose out of protest over the policy responses to the financial crisis and recession. One of them is more or less explicitly anti-inflation and also espouses principles of laissez-faire. The Tea Party movement began in 2007 during Ron Paul's presidential campaign, but really took hold in early 2009, right after the bailouts and as the stimulus fight was being played out. This was a direct response to significant government intervention into the economy via bailouts and stimulus spending. This group wanted austerity, in large part because of fears of future taxation and inflation (which they often view as a form of taxation). Occupy Wall Street, on the other hand, is not ideologically opposed to government intervention. That movement did not form until 2011, when it became clear that the economic recovery was going to be slow overall but that the banks had recovered relatively quickly. OWS opposed the types of intervention that we, pace Waldman, chose. This group wasn't professing opposition to austerity... they were protesting expansionary fiscal policies! They opposed the distributional nature of those expansionary fiscal policies. In some cases they too wanted austerity, but via tax increases on corporations and wealthy individuals rather than cuts in spending. The Greeks, meanwhile, are protesting the slashing of pensions and raising of taxes. These are very different movements, animated by opposition to different sets of policies. Lumping all of those policies together as "austerity" doesn't capture that. Given that, and given the loaded nature of the term, I think we need another word to describe the U.S. experience as distinct from the Greece experience. For the latter "austerity" works fine. For the former I propose "drudgery". *Is c) true? Maybe in the eye of the beholder. In my view, the U.S.'s bailouts of Wall St/GM + extension of tax cuts + new tax cuts + automatic stabilizers + increase in nominal government spending + stimulus > the miniscule cuts that have been imposed since 2008. In which case... is that really austerity? **Picking on him again out of laziness... I had this link at hand already. ***At least I think we are. It's been awhile since I've read it. [T]his recent survey paper (pdf) on teen births, which are much higher in America than in other advanced countries. The authors find evidence suggesting that inequality and lack of mobility are central, another sign that Wilkinson-type views about the corrosive effects of inequality are going seriously mainstream. ... [I]nteresting stuff — and more evidence that we are gradually poisoning our society with inequity. We believe that the high rate of teen childbearing in the United States matters because it is a marker of a social problem, rather than the underlying social problem itself. If a teenager has a baby because her life chances seem so limited that her life will not be any better if she delays childbearing, then teen childbearing is unlikely to be causing much of a detrimental effect. Our review of the evidence is consistent with this position. One thing that we have not done is explain the dramatic decline in teen childbearing in the United States over the past 20 years. 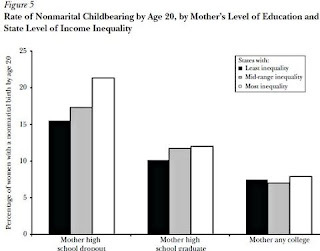 Although we believe that inequality and lack of opportunity explains a substantial share of the geographic variation in teen childbearing, it is not a candidate explanation for the downward trend in the United States over the past two decades, primarily because the 50/10 ratio that we rely on as a measure of inequality has not changed much during this period (although our results are insensitive to the specific measure used). So what on earth did Krugman read? If teen childbearing has been going down at the same time that inequality has been going up that would seem like prima facie evidence that income inequality is not causing teen childbearing. 1. Have Fed inflation forecast errors been different during Democratic and Republican presidencies? Question 1: The Fed did tend to overestimate inflation during Democratic presidencies and underestimate it during Republican presidencies (an Error/Actual score of 0 means that the forecasters perfectly predicted actual inflation). Admittedly we have a pretty small sample of Democratic presidencies (only Carter and Clinton), but it is striking how all of the big underestimates were during Republican presidencies and almost all of the big overestimates were when Democrats had power. Maybe, Federal Reserve staff anticipate--to an incorrect degree--that Democratic presidents will pursue expansionary policies and vice versa. Question 2: It is not as clear that forecasts systematically differ in election periods as opposed to non-election periods. Though the spread of the errors across parties does shrink very close to the election. I wonder why this might be? 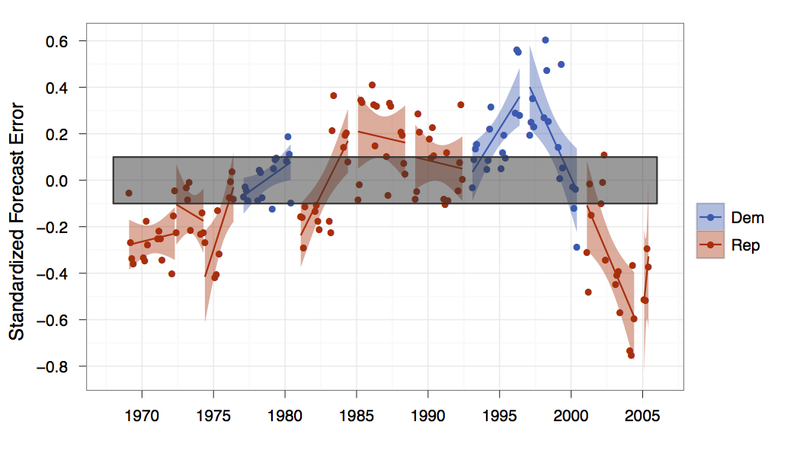 The partisan effect is less obvious than in the earlier graph, but is is clear that during this time period the big over estimations are during Democratic presidencies and the big (actually almost all) underestimations are during Republican ones. The effect would be even stronger if we took out the end of Reagan's first term and his second one, where Fed staff may not have fully adjusted their forecasting to reflect the Volker-Greenspan era of moderate inflation. This gets to the heart of the difference between rules-based and principles-based regulation. You could have a version of the Volcker Rule that functions by empowering a set of bank regulators to implement the principle behind the rule. Sloan agrees that "the principle sounds wonderful and simple -- don't let banks use federally insured deposits for risky trades" so you could tell the regulators just that, with no further details or clarification. A college dorm that has a rule against loud noise or music after 10PM on weeknights isn't going to follow that up with a detailed regulatory definitions of "loud", "noise", and "music" that you can then try to find loopholes in. The issue is that if the RA decides you're being too noisy, he tells you to quiet down. The problem with principles-based regulation in this context is that you might fear that banks will use their political influence to get regulators to engage in a lot of forebearance. The problem with rules-based regulation in this context is that it's really hard to turn a principle into a rule. That's not "the" problem. That's "a" problem. Another problem is that regulators will never be given one task. They'll be given multiple tasks. One might be "don't let banks use federally insured deposits for risky trades" and another might be "don't restrict our financial sector so much that foreign firms take market share". Or maybe "force banks to make safe investments" but also "lend to certain interest groups -- e.g. governments -- at privileged rates". Or maybe "regulate the banking sector" and also "manage the macroeconomy". Many of these tasks are contradictory at some margin, and that margin is precisely what is being exposed by the time we get to crisis. Another question is "what's a risky trade"? I've been watching the Frontline documentary on the financial crisis, and one thing is clear: everybody thought that securitization was reducing risk, not concentrating it. At least at first. When I say "everybody" I mean it. Other than Brooksley Born the regulators, firm managers, journalists, academics... everybody thought this stuff was making the financial system more stable. Some people started calling this into question by the mid-2000s but at that point it was already too late. So a discretionary principle of "reduce risk" -- which is more or less what we had during the 1990s and 2000s, combined with pretty lax capital requirements -- would likely not have led to a reduction in the activity that culminated in crisis and may even have exacerbated it. This isn't as simple as a dorm RA telling people to turn down their music after 10 pm. What follows is prompted by the news that the Justice Department has filed suit against Joe Arpaio, Sheriff of Maricopa County, AZ, alleging that he has violated the civil "rights of Hispanic inmates and suspects." 1. If you express faith in the utilitarian value of free markets, then you can't be selective. If capital and goods markets are to be free, then labor markets should be as well. 2. If you express concern about development and the plight of the poor, then you can't be selective. If we want to reduce poverty, then we need to encourage things that reduce poverty. Freer immigration is near the top of that list. 3. If you think that corporation are -- on balance -- a force for good in the world, then you should favor things that help corporations form and prosper. Access to an eager labor force is attractive to corporations, as they have repeatedly made clear. 4. If you wish to emancipate the tired, the poor, the huddled masses yearning to breathe free then you should let them breathe free. Let them escape the rule of the corrupt and capricious. Let them engage in the pursuit of happiness. In other words, if the word "solidarity" means anything to you, then show solidarity. 5. If you are not a nativist, nor any other sort of bigot, then you should support policies that are anti-nativist and anti-bigot. 6. If you are concerned about demographic changes, the fiscal balance, the state of the economies of most advanced industrial nations, then you should support actions that will bring young workers into the population, who will pay taxes and help bring the economy and public balance sheet back into a sustainable equilibrium. 7. If you care about the rights of humans, then surely the rights of freedom of movement and association are at the top of your list. I feel like this little rant gives little room for dissenters to move. They can't be make a market-based argument. They can't make an anti-market-based argument. They can't make a liberty-based argument. Slight objections -- such as "national security" -- are very easily slapped away by both statistics and simple logic. * All that remains is some form of bigotry, either soft or not-so-soft, and these are not restricted to either side of the left-right political spectrum. There is no good moral, ethical, economic, or pragmatic reason for continuing the horrible immigration policies we currently enforce in the U.S. and throughout the developed world. There are very good reasons to support liberalizing human movement from all over the ideological political spectrum, from the internationalist left to the corporatist right. There are no very good reasons to oppose it other than nativism, which is both ugly and incoherent. This is equally true whether it comes from the left or the right. In my opinion this is the greatest civil rights issue of our time. And we're failing. *Statistically, so far as I can tell, almost no immigrants are terrorists or otherwise threaten the integrity of their host countries. It's not even clear that immigration increases rates of crime -- setting aside the abhorrent fact that walking across an imaginary line is a crime in and of itself -- despite the fact that most immigrants are young and poor, which are (statistically) the most likely groups to resort to crime. This is, of course, a reference to Kindleberger's famous maxim of how the world descended into chaos during the period in between World Wars I and II: the British were unable to lead and the U.S. was unwilling to do so. The resulting anarchy was therefore a unnecessary tragedy which, according to Ikenberry, the U.S. learned from and was determined not to replicate following WWII. The implication is that, if this continues, calamity is likely in our future. I'm in broad agreement with Bremmer in theoretical terms, but I don't see as much U.S. retrenchment as he does. The Obama administration may be many things but isolationist is not one of them. The foreign policy orientation of the party challenging Obama is not either. And while "there will be no Marshall Plan for Europe" this time, there is also less need for one. The Federal Reserve has taken many important actions to stabilize the global financial system, and it is not at all clear to me that intervening in Syria or bombing Iran would make the Middle East more stable rather than less. Nor is it clear to me that those options are truly off the table. In other words, I think the last four years demonstrate that the current global order is actually remarkably durable. More durable than many believed. Global financial and security institutions have worked pretty well, or at least as well as they had previously. I see no reason to expect that to change in the next few years. I'm not actually sure the financial crisis was a catalyst for "creative destruction" (Bremmer's term, via Schumpeter) of the global order. It was a body blow, to be sure, but the structure of the system seems to have held. We haven't descended into anarchy yet, even if the residual effects are still percolating through. Moreover, the U.S. looks better positioned to remain central to the international system now than at any point since 2007 (or perhaps even earlier). So yes, there was a shock, but the center held, and now appears to be reinforcing itself. The wave appears to have crested, broken, and is now rolling back. So I don't expect to see the major changes that Bremmer does. Bankers and lawyers said the proposals, if approved, would push up capital requirments and could making buying and selling assets – as opposed to holding them to maturity – far less profitable. The proposal is expected to hit institutions with large trading desks, such as Barclays, Goldman Sachs and Deutsche Bank, particularly hard. Higher capital requirements could also make it harder for some European banks to gain any advantage over their US rivals when they have to stop trading with their own capital under the US Volcker rule. 1. Financial distress in the U.S. leads to domestic calls for re-regulation. 2. Some of these regulations would put U.S. firms at a competitive disadvantage vis-a-vis their international competitors. 3. These regulations get extended into the international arena to shift some of the costs from American firms to their foreign competitors. 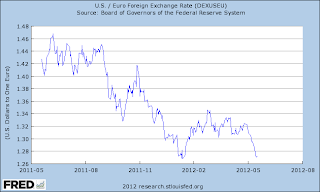 The U.S. is able to do this because of their relative power within the global financial system. Sure. But sometimes the simple logic works pretty damn well. Today comes two developments that are relevant to this discussion. First, and as recently expected, Nicholas Sarkozy lost the French presidency to Francois Hollande in an election that was widely viewed as a referendum on the EU's approach to the ongoing debt crisis, and in particular the Franco-German alliance to push Euro-wide austerity. Hollande has promised a new direction that focuses on growth, rather than austerity, and an unwillingness to let French economic policy be determined by Berlin. As such, the vote appears to be a rebuke of Sarkozy's cozy relationship with German Chancellor Angela Merkel, and a reinforcement of French sovereignty over European solidarity. (Ms. Merkel's party lost another local election, indicating that her citizens aren't especially thrilled with her policy course either.) The election was also notable for the fracture in France's right-wing parties, as the far-right nationalist National Front party received nearly one-fifth of all votes. Greek voters appeared to radically redraw the political map on Sunday, bolstering the far left and neo-Nazi right in a wave of protest against the dominant political parties they blame for the country’s economic collapse. The parliamentary elections were the first time that Greece’s foreign loan agreement had been put to a democratic test, and the outcome appeared clear: a rejection of the terms of the bailout and a fragmentation of the vote so severe that the front-runner is expected to have extreme difficulty in forming a government, let alone one that can either enforce or renegotiate the terms of the bailout. The elections were seen as a pivotal test, determining both the country’s future in Europe and its prospects for economic recovery and the outcome, along with that in France, could resonate far beyond Europe, possibly leading to more upheaval in the euro zone. The early results were also a clear rebuke to European leaders that their strategy for Greece had failed. You can see what you want to see here. If you think that materialist concerns will dominate European identity in determining the path of the European Union, then there's plenty here for that: the rise of far-right nationalist parties especially, and not just in France and Greece. On the other hand, you could view Hollande's election as a sign that the austerity regime is on the verge of being replaced by a more generous system of transfers that will reinforce European solidarity and identity. Many Europeanists have been expecting such a transformation of identity, from a nationalist identity to a European identity, over time. This is certainly possible in the long run -- think about how we used to refer "These" United States and now refer to "The" United States -- but there are a lot of short-run pitfalls that the European project will have to overcome first. We've had many reminders of these difficulties over the last few years, and for now it appears that the materialists have the upper hand. I would be shocked if markets didn't respond negatively to these developments, and ultimately markets (and German voters) will decide the eurozone's future whether anyone wants them to or not. Greek voters have lashed out a number of times, but each new incoming leader finds themselves operating under the same constraints. They need money, and to get it they have to do what the lenders want them to do. If German and French voters decide that they're sick of paying then it doesn't matter who runs the Greek government... they'll have no choice but to default. That, to me, is still the most likely outcome. Recent research on the sources of individual attitudes toward trade policy comes to very different conclusions about the role of economic self-interest. The skeptical view suggests that long-standing symbolic predispositions and sociotropic perceptions shape trade policy opinions more than one's own material well-being. We believe this conclusion is premature for two reasons. First, the practice of using one attitude to predict another raises questions about direction of causation that cannot be answered with the data at hand. This problem is most obvious when questions about the expected impact of trade are used to predict opinions about trade policy. Second, the understanding of self-interest employed in most studies of trade policy attitudes is unrealistically narrow. In reality, the close relationship between individual economic interests and the interests of the groups in which individuals are embedded creates indirect pathways through which one's position in the economy can shape individual trade policy preferences. We use the data employed by Mansfield and Mutz to support our argument that a more complete account of trade attitude formation is needed and that in such an account economic interests may yet play an important role.